Ephemeris for Tuesday, October 16th. The Sun will rise at 7:59. It’ll be up for 10 hours and 56 minutes, setting at 6:56. The Moon, at first quarter today, will set at 12:36 tomorrow morning. Last Thursday the 11th a cosmonaut, Alexy Ovchinin and an astronaut, Nick Hague were launched toward the International Space Station by a Russian Soyuz rocket. At about the time the four first stage boosters separated from the second stage, something happened, and the capsule containing the men was weightless instead of being boosted by the second stage of the rocket. The Soyuz has an escape system, so the descent capsule separated from the protective shroud and the orbital module on top of it and the service module below it. To make a landing downrange. The men are safe, but the three persons in the ISS must return by mid-December, whether or not they are relieved as their Soyuz capsule cannot be safely flown after that. The above with the exception of the last line is what goes out on the 59 second length of my radio program. What follows is a more complete explanation of the problems in store for the International Space Station as the Russians attempt to determine the cause of the failure, fix the problem and begin flying again. Cosmonauts and astronauts visiting the International Space Station generally use the same Soyuz that brought them up and docked to the station to return to the Earth. It happens that the reaction control thrusters used to orient the spacecraft use hydrogen peroxide (H2O2) as a monopropellant. It decomposes into oxygen and steam when in contact with a catalyst to provide thrust. However, hydrogen peroxide is unstable if left to itself, slowly decomposing. This gives the Soyuz a useful lifetime of about 200 days on orbit. The current crew of Sergey Prokopyev, Serena M. Auñón-Chancellor, and Alexander Gerst was launched from Baikonur, Kazakhstan on June 8, 2018. The 200 days runs out in late December. Their original scheduled return date was December 13th. 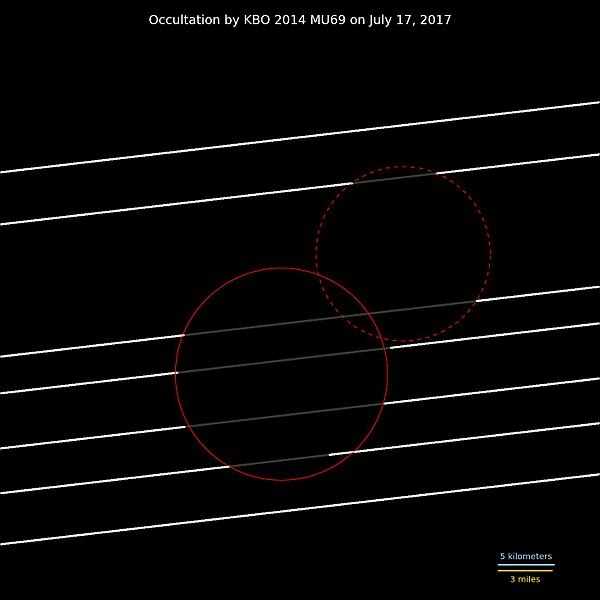 06/08/2018 – Ephemeris – A second Moon race? Ephemeris for Monday, June 18th. Today the Sun will be up for 15 hours and 34 minutes, setting at 9:31, and it will rise tomorrow at 5:56. The Moon, 2 days before first quarter, will set at 1:30 tomorrow morning. 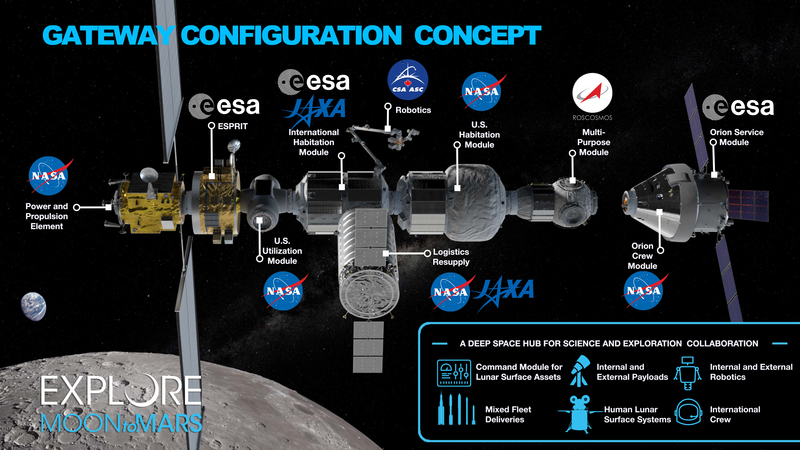 The Moon as a destination is becoming a hot topic among the space faring nations. Who will land humans first in this second wave since the United States landed there in the late 1960s and early 1970s: The Chinese, Russians, us? Or maybe someone else? Next year July 20th will be the 50th anniversary of Neil Armstrong’s first step onto the lunar surface. The goal this time is not to just visit, but to stay. The lunar surface is a harsh environment of extremes in temperatures and radiation from the Sun, and from the universe beyond. There is shelter beneath the surface, in lava tubes. There is one lava tube with a collapsed roof, a skylight, which could provide access in a place called the Marius Hills. 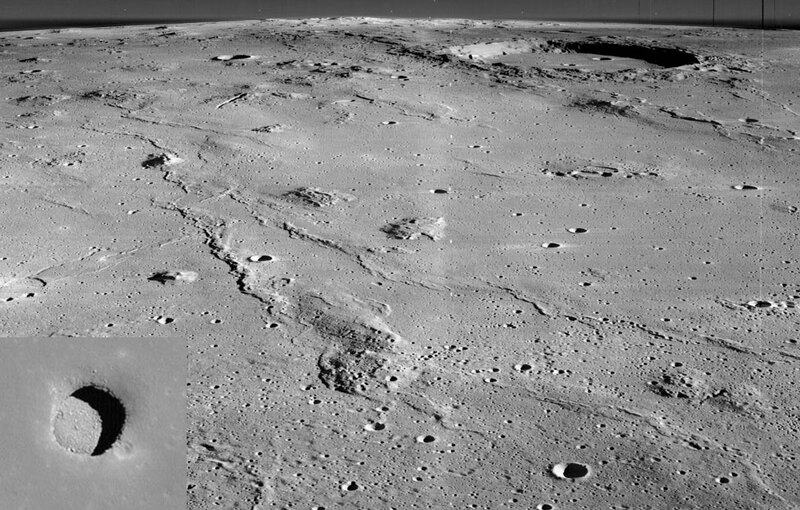 An oblique view of the Marius Hills from the Lunar Orbiter 2, with an inset look into a skylight into a lava tube from the Lunar Reconnaissance Orbiter at the lower left. Click on image to enlarge. Credit NASA, Lunar Orbiter 2, Lunar Reconnaissance Orbiter. The picture above was posted on Astronomy Picture of the Day (APOD) 2017 October 2017: https://apod.nasa.gov/apod/ap171025.html, where there is more information. Ephemeris for Memorial Day, Monday, May 29th. Today the Sun will be up for 15 hours and 16 minutes, setting at 9:18, and it will rise tomorrow at 6:01. The Moon, 3 days before first quarter, will set at 1:04 tomorrow morning. Today we pause to remember those who gave their lives for our country. For purposes of this program that includes those courageous enough to sit on top of or beside a million pounds of explosives to be launched into space. From the three astronauts who died in the Apollo one file in 1967, the explosion of the Space Shuttle Challenger in 1986, to the disintegration of the Columbia in 2003, 17 Americans and other nationals have died in NASA space accidents. The Russians too have lost cosmonauts in the exploration of space. Brothers and sisters in the quest for knowledge and to expand the horizons of human habitation. Per aspera, ad astra, Through difficulties to the stars! Ephemeris for Tuesday, October 18th. The Sun will rise at 8:02. It’ll be up for 10 hours and 49 minutes, setting at 6:52. The Moon, 2 days past full, will rise at 9:07 this evening. You’ve probably haven’t heard of the ExoMars mission before or even recently. 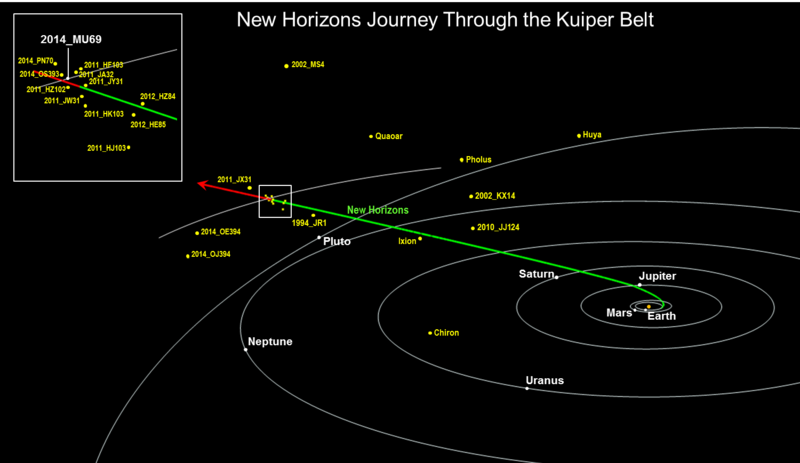 That’s the way Mars missions go, due to their long cruise phase. It was launched by the Europeans and Russians back in March. ExoMars is an orbiter with an attached lander. The lander named Schiaparelli after the famed 19th century astronomer, separated from the Trace Gas Orbiter two days ago to land on Mars. A few hours later the orbiter made a thruster burn to miss Mars and not follow the lander into Mars’ atmosphere. 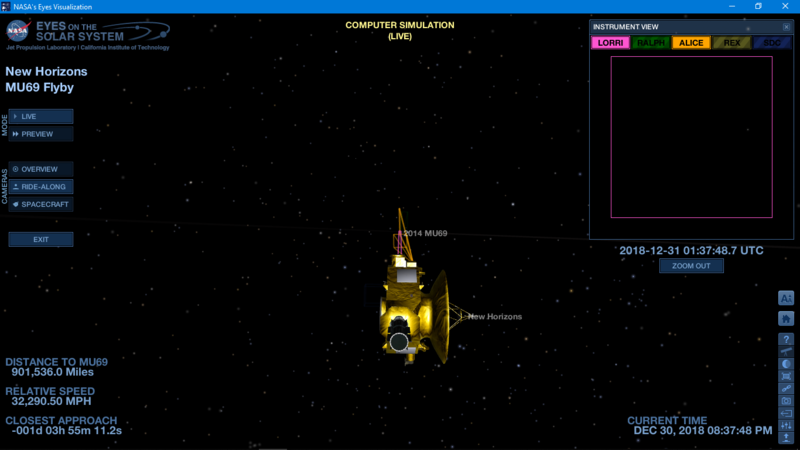 The lander will hit Mars’ atmosphere at about 10:52 a.m. tomorrow, with landing 5 minutes later. The Schiaparelli lander will operate on batteries only with a lifetime of a few days. It will take a few images as it lands, but will not take images from the surface. Artist’s visualization of releasing the Schiaparelli lander. Credit ESA.